Yesterday, President Obama appointed former Ohio Attorney General Richard Cordray to be the first chair of the new Consumer Financial Protection Bureau. Cordray’s appointment was a so-called “recess appointment” made while the Senate was not in session. 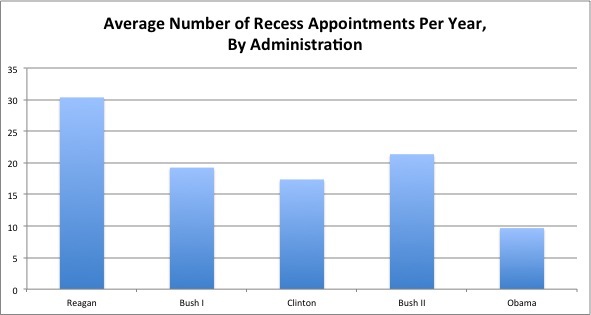 Not surprisingly, Republicans have been highly critical of President Obama’s decision to make the recess appointment. Their criticisms have focused on several points: First, that the Senate was not actually in recess, and second, that President Obama’s use of the recess appointment option was an arrogant, unprecedented, undemocratic abuse of power. So, with that background out of the way, let’s look at the issues. This is an extraordinary and entirely unprecedented power grab by President Obama that defies centuries of practice and the legal advice of his own Justice Department… The precedent that would be set by this cavalier action would have a devastating effect on the checks and balances that are enshrined in our Constitution. So was President Obama’s decision to make a recess appointment “unprecedented”? And what about checks and balances? Hmm. It would appear that President Reagan, President George H.W. Bush, and President George W. Bush are all more “undemocratic” (arrogant?) than both President Clinton and President Obama. So maybe Republicans protest a wee bit too much on this issue? Can anyone say “hypocrisy”? What about those stones and glass houses? But the real issue isn’t whether President Obama was being undemocratic or arrogant or acting in an unprecedented way. Instead, we should focus on the conduct of the Republicans. Remember that the Constitution requires the advise and consent of the Senate. However, Senate Republicans have blocked consideration of Cordray’s nomination to head the Consumer Financial Protection Bureau. Well, in this day and age, that’s not so unusual. Filibusters and other delaying tactics to prolong votes on unpopular nominees is nothing new. But that’s not what happened to Cordray’s nomination. Just to be clear, the organization that we’re discussing is the Consumer Financial Protection Bureau. It is designed to help protect consumers. But Republicans don’t like that, do they? RFO!!! that's for Right F**king On! Keep up the intelligent discourse. The Republicans time and again have shown that they should be impeached or recalled as they are REFUSING to do their job. P pox on their mansions!